Since we first posted about the TV channel line-up yesterday many Carnival cruisers had asked Carnival Cruise Line Ambassador John Heald what’s going on. He ended up posting further details about the channel changes. I’ve had a few guests comment on the TV programming changes we are making onboard. We’ve been updating our systems and the new package of channels should be effective by Friday across the North American fleet. All guests sailing on Carnival ships operating in North America will enjoy a great new lineup of complimentary in-stateroom TV. The new lineup will include popular, top-rated network channels such as HGTV, Food Network, Travel Channel and Discovery. For our younger guest we now offer Nickelodeon which is the number one entertainment channel for kids. For 3-7 age category we have added Kids Central with age appropriate programming available at all times, day and night. The news source will be a CBS National News channel that I’m told will broadcast programs providing original reporting, interviews and breaking news 24 hours a day. Some channels have been removed to allow for the transmission of these new channels. Your complimentary movie channel, our original Carnival content as well as the sports programming at our bars will remain unchanged at this time. 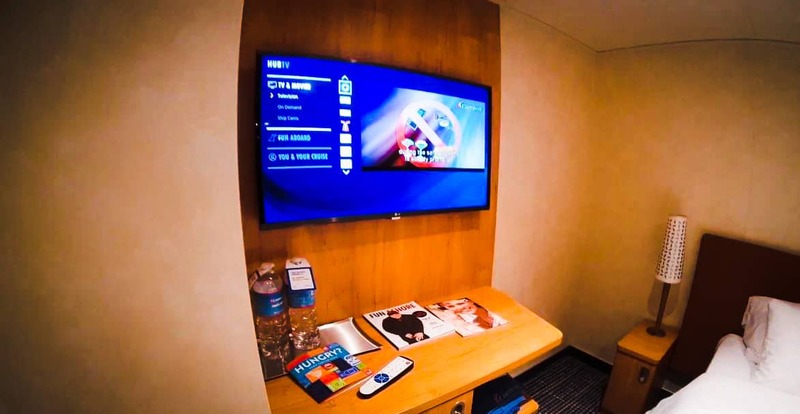 Carnival Cruise Line has started rolling out changes to the stateroom TV channels. A new line-up of offerings for guests to watch is being implemented on Carnival ships. This also includes the removal of the popular CNN channel. Guests on some Carnival cruise ships have already received letters to their staterooms stating that during the voyage a change in the TV channels is being implemented. We already know that Carnival Sunshine, Carnival Conquest, and Carnival Pride are confirmed to have the stateroom channels changed. Many guests have gone to social media and posted the letters from the cruise line which also includes a list on the back of the current channels and what they will be replaced with. We will provide the full list further down. We are excited to announce a new network channel line-up coming to your stateroom television. We will begin migrating our content on the morning of January 17 and expect the change to be completed by noon on January 18. During this time, you may experience brief service interruptions as each channel changes over. Our new line-up includes popular, top-rated channels such as Nickelodeon, HGTV, Food Network, Travel Channel and Discovery. IN addition, A CBS national news channel will now broadcast critically acclaimed programs providing original reporting, interviews and breaking news 24 hours a day. Your complimentary movie channel, our original Carnival content channels and sports programming at our bars will not experience any interruptions during this process. The roll our likely depends on the ship itinerary and will eventually hot the entire fleet. On the three Carnival ships which have been confirmed, there are to be brief service interruptions while the channels are changed over. This will be completed by noon, January 18. So as you can see from the list above there is a total of ten channel changes with two of them to be decided (TBD). It will depend on the cruise ships on when the new channels will be moved over so just keep an eye for a letter from Carnival in the stateroom on embarkation day. The TV line-up change comes not long after the cruise line had huge backlash for ditching complementary room service, they eventually canceled the new menu to have a second look at it. Carnival has also increased prices for several packages in recent months, let’s hope this trend doesn’t continue.